Exodus Exterminating- Birds | Exodus Exterminating Inc. Many people enjoy feeding and observing birds in their backyards. Birds eat insects, like grubs, and can be beneficial to the maintenance of your lawn. Unfortunately, birds like to nest in eaves, roofs, gutters, vents and other places around your home. They may dig holes in roofs, get into attics and other spaces to build their nests. Bird droppings can damage your home or car, make a mess on pavement and patios and droppings may carry parasites causing health concerns. 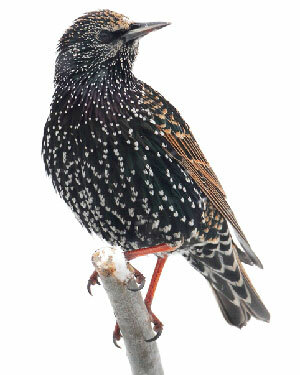 Exodus specializes in handling pest bird species such as pigeons, starlings and sparrows. Did you know that woodpeckers are a federally protected bird species? Did you know that pest birds that infest structures present a risk of introducing bird mite populations that may infest the living/work area? Should I remove bird nests? Many species of birds are protected by state laws. It’s best to consult with a pest management professional before removing any nests. Pest management professionals have the education, equipment and skills necessary to effectively address a bird problem. Treating for birds can be difficult, depending on where they perch or nest. A pest management professional uses their expertise to identify the pest problem and determine the best possible solution to resolve the bird infestation. The best long term solution to bird control is to modify their habitat. Removing bird feeders, and limiting access to protective shelter for roosting and nesting are the primary goals of bird control pest management. If you encounter a nuisance wildlife issue, call a professional. Our experienced technicians can perform a comprehensive inspection to your home or building exterior to ensure there are no openings for birds to enter. Some common methods of bird exclusion include installing exclusion devices. Devices include: electronic devises, bird spikes, nets or wire installed on surfaces used by birds for roosting and nesting. Bird screening is used to prevent access to attics and gutters, or to cover food or water sources such as roof top air conditioners. We will employ techniques and products that are humane, efficient and effective to the target birds.